Europe Declares War on ‘Veggie Burgers’A new rule would mean companies could no longer describe vegetable-based products with the names of meat products. Is This Pub Owner the World’s Best Trip Advisor User?He fights back against what he claims are lies and falsehoods in reviews. Entire City of Philadelphia Turns on StarbucksCould this be the start of a movement? L.A. Times Ignites Furious Debate After Naming In-N-Out Fries Worst in AmericaTruly, no fry can compete in the terribleness category. Everything You Know About Pizza Is Wrong … MaybeDoes America have a forgotten father of pies? Howard Schultz ‘Seriously Considering’ Running For PresidentThe former Starbucks CEO wants to bring Frappuccinomics to the White House. Hershey’s Kisses Are BrokenChristmas is ruined for grandmas everywhere. Feds Bust Tuna RacketMajor companies conspired to take advantage of America’s love of canned food. French Butchers Want ‘Militant Vegans’ to Stop Attacking Their ShopsThey claim their businesses are being vandalized. Did Trump Nominate Brett Kavanaugh Because of His Horrible Taste in Food?The Supreme Court nominee, a law-school roommate revealed, was known as the ‘pasta with ketchup’ guy. Trump Trade War Spoiling Export Market for American Cheese MakersAmerican companies are facing new tariffs, while the European Union signs deal to cut tariffs and increase protections on European cheese. José Andrés Says Ivanka Trump Didn’t Have Him Booted From Party After AllHe settled a high-profile lawsuit with the president last year. France Descends Into Chaos Over Nutella SalesHazelnut riots hit Paris. Netherlands Rocked by Countrywide Herring ScandalSomething smells fishy in an annual taste test. Pizza Hut to Papa John’s: NFL Protests Haven’t Hurt Our SalesThe rival chain chimes in. Lyft Drivers Really Hate the New Taco Bell Drive-through FeatureIn their eyes, it means bigger messes and less money. Park Officials Removed a Chef for Being Too ‘Vulgar’With a nickname like that, how could anyone have known? New York Pizza Feuds, RankedIt’s a tradition as essential as a cheese slice. 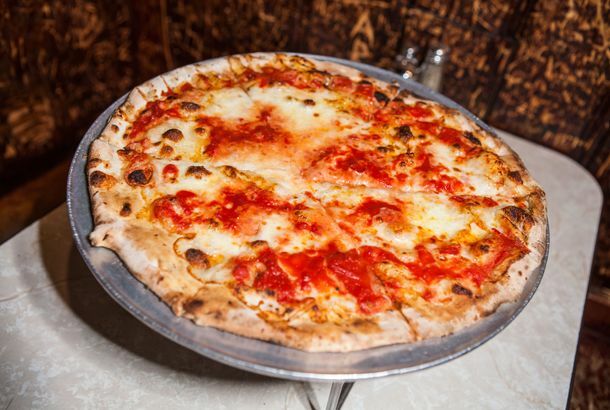 Disgruntled Investors Are Suing the Owners of Brooklyn’s Trendiest PizzeriasBehind-the-scenes tension has exploded into a very public lawsuit at Emmy Squared. Did Monsanto Hire Online Trolls to Attack Critics?A pending lawsuit makes the allegation. A Brooklyn Café Is Suing Starbucks for Stealing the Unicorn FrappuccinoIts lawsuit says the chain’s Unicorn Frappuccino is trademark infringement. Donald Trump Could Be Deposed for 7 Hours in the José Andrés Lawsuit in JanuaryHis lawyers’ request to limit the questioning to a couple hours was denied. Fed-Up Chef Challenges Local Critics to Actually Cook Something for the PublicHe’s inviting them to prepare a three-course meal for a panel of judges. Donald Trump Also Grossed Out by John Kasich’s ‘Disgusting’The Republican front-runner only eats small, classy bites of food, you see. Carbonaragate Scandal Rocks EuropeItalians are outraged over a one-pot French recipe for carbonara, which includes onions and — what’s this? — crème fraîche. Oh, no. Manager at Landmark Boston Restaurant Rips Reporter After Scathing ReviewSo is the Union Oyster House — “America’s oldest restaurant” — just a terrible, overpriced tourist trap? Texans Are Really Pissed About Austin Claiming the Breakfast TacoA San Antonio resident even launched a Change.org petition to exile someone from the state. Customers Trash Pizzeria After Receiving Cheesy Garlic KnotsWho even wants garlic knots sans cheese? A Totally Chill Deli Customer Punched an Employee for Making His Sandwich WrongIt’s unclear if the lettuce, tomato, and onion were incorrectly layered. The National Restaurant Association Plans to Sue the DOH Over Salt LabelingThe group says the new rule goes too far beyond traditional government oversight.